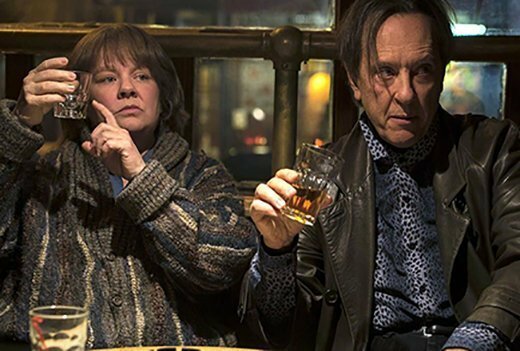 Lee Israel (Melissa McCarthy) and Jack Hock (Richard E. Grant) are buddies in drink and crime in Marielle Heller's "Can You Ever Forgive Me?" hen we’re introduced to Lee Israel (Melissa McCarthy), she’s just been fired (apparently from “The New Yorker” magazine, where she edits copy in a cubicle) for her bad attitude and foul language. She’s already an unhappy, acerbic, 51-year-old alcoholic loner living in a filthy Upper West Side apartment in New York City with her only “friend,” a sickly cat who defecates under the bed and fails to return her affection. Out of work, she can’t pay her rent or afford toilet paper. She begins to steal, starting with a needed winter coat (and the toilet paper) at her agent’s (Jane Curtin) upper-crust party. Into this slough of despond come a few rays of hope and possibility. One is an offer of friendship (and perhaps more), from a younger bookstore owner, Anna (a wistful Dolly Wells). Anna’s offer is more than Lee can handle. A melancholy bar scene produces another relationship, this one with a witty, charismatic, cocaine-using, gay, homeless low-life, Jack Hock. Played to zany perfection by Richard E. Grant, Jack can make one appreciate an immoral thief. He and Lee share a dislike of the elite; she stole one of their coats, he peed on their furs. Welcome to the buddy film. As unlikely as it is that extrovert Jack can help introvert Lee, their story is the emotional heart of the film, raising the issue of whether Lee is capable of caring about or opening up to the people around her, whoever they might be. Although a quick take on Lee is that she’s an incorrigible misanthrope, she’s actually neither unlikeable nor insensitive. In a speech she makes at the end of the film to the judge who will sentence her, she reveals herself to be quite self-aware. Lee may not have a heart of gold (thank goodness), but she does have a heart. McCarthy is at her best in this speech, and her acting is solid throughout the film, capturing Lee’s neurotic interiority. McCarthy has been talked about for a possible Oscar nomination, and, while she’s very good here, perhaps it’s the conversion of a superb comic into a serious actor that’s drawing that level of attention. However well done, the emotional valence of the film is ancillary to the key element of the plot: Lee’s venture into white-collar crime, specifically the creating and forging of letters written by deceased sharp-tongued celebrities—Dorothy Parker, Lillian Hellman, and Noel Coward among them — and the sale of those letters to unsuspecting dealers. Welcome to the caper film. There’s tension here — will she get caught? — but also repetition (writing, forging, selling, repeat). Because the film is “based on a true story,” one can assume that most of this illicit activity really happened, that Lee Israel forged and sold some 400 letters. That’s a lot of crime, presumably with real economic consequences for the victims. Except there appear to be no consequences of note, and we’re shown no one being damaged. The implication is that those who were scammed were elites who could bear the cost of the fraud, as well as professionals who should have known better. The most profound result of Lee’s tenure as a forger is that she discovers her “voice.” There’s a tragic element to this discovery. The voice she finds is less than original, associated with Parker and Coward and that earlier generation of writers. But there is also, for Lee, exhilaration. Her forgery career was “the best time of my life,” she explains to the judge, a time that allowed her to understand that she could use her essence—the same foul-mouthed, barbed wit that got her fired — to make money in the literary marketplace. 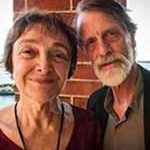 There are signs, too — a cloying touch, perhaps—that the experience has given Lee a new emotional maturity: tears with an ailing (from AIDS) Jack in the bar, a renewed interest in reading the bookseller’s short-story manuscript. “Can you ever forgive me?” the title asks, repeating one of the lines Lee created for a forged Dorothy Parker letter. What’s to forgive? Crime pays! Can You Ever Forgive me? ★★★ Directed by Marielle Heller. With Melissa McCarthy, Richard E. Grant, Dolly Wells, and Jane Curtin.